Paterson woman faced eviction for daughter’s emotional support dog. Now, she’s getting $20,000 in settlement. A woman is getting $20,000 after she was kicked out of the Brooks-Sloate Terrace because her teenage daughter had an emotional support dog to cope with depression. Brooks-Sloate Terrace Cooperative Association and its property management contractor Colonial Mutual Housing Corporation will have to pay the former tenant, Jerrica Spence, and put in place a written anti-discrimination policy as part of the settlement with the New Jersey Division on Civil Rights. Policy must contain clear protocols for requesting an exception to the “no pets” policy for emotional support animals. Spence’s problems at the Brooks-Sloate Terrace began on Nov. 11, 2015. Property manager Wineth Stephens entered her apartment — Spence began renting a three-bedroom apartment for $1,325 on Apr. 1, 2015 — with an exterminator for routine pest control services. Stephens saw a “white dog” in a cage. Next day, Spence, who had been living with her minor children, son and daughter, at the apartment, was issued a notice of violation and cease and desist. She had broken her lease agreement which stated tenants are not allowed to have pets. On Nov. 17, 2015, Spence met with Stephens; Mary Joyner, president of the board of directors; Carol Austin, treasurer for the board of directors; and Scott Pierkarsky, attorney for the cooperative in the matter. Spence explained the dog was a gift to her 13-year-old daughter, who had been very depressed by her father’s death. The daughter is attached to the dog and her condition has been improving as a result, she told them. She told them she could not part with the dog. On Nov. 18, 2015, Spence wrote to meet with the full board to make her case. “My daughter made the honor roll. I am so proud of her. It’s been many years since she had all A’s and B’s. She’s definitely improving!” she wrote in her letter. Pierkarsky replied to her letter. “In connection with your last letter to management, there will be no further meetings or documents provided, as the same is not necessary or required. You are in violation with the dog that you refuse to remove,” said Pierkarsky in his response. On Dec. 3, 2015, Spence presented a doctor’s note from Vitale Family Medicine. “My patient [D.S.] has Conduct disorder which has been aggravated by the loss of her father. Pet therapy is a medical treatment that is recommended for her and her ability to heal. I recommend that the patient have a dog @home for her treatment of this disease,” the note read. 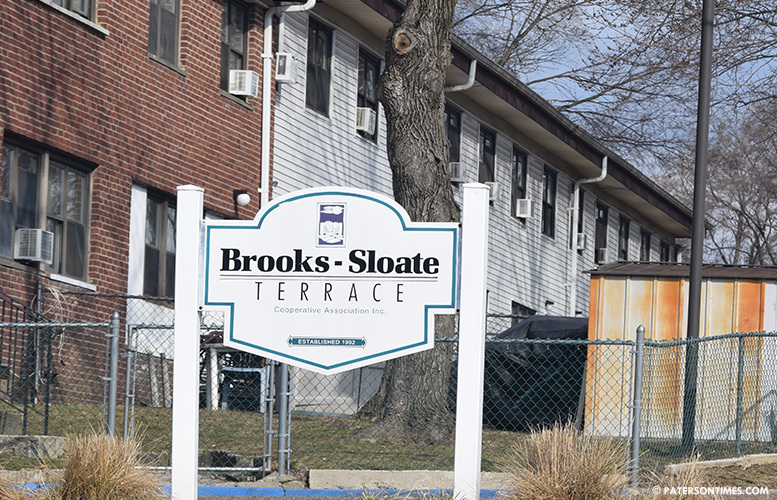 Brooks-Sloate Terrace did not modify its violation or vacate notice in response to the doctor’s note, according to court records. Instead, Colonial Mutual Housing Corporation filed in New Jersey Superior Court to evict Spence and her two children. The Division on Civil Rights argued the cooperative’s actions amount to illegal disability discrimination. Brooks-Sloate Terrace denied wrongdoing, but argued Spence conceded she had violated its no-pet rule and agreed to move out. A judge dismissed the landlord-tenant case without prejudice. Court records show Colonial Mutual Housing Corporation demanded $6,918 from Spence in the case. Brooks-Sloate and Colonial Mutual must release Spence from all claims like rent in arrears, pet fines, legal fees, and property damage as part of the settlement. Spence also has to be reinstated on the cooperative’s waiting list to become a owner of a housing unit at the development. On Feb. 11, 2016, Spence filed a complaint with the New Jersey Division on Civil Rights alleging Brooks-Sloate Terrace and Colonial Mutual Housing denied her request for reasonable disability accommodation in violation of New Jersey Law Against Discrimination. The state cited a U.S. Department of Housing and Urban Development (HUD) rule which states an emotional support animal, without training, may relieve depression and anxiety. Neither Brooks-Sloate nor Colonial Mutual provided evidence that the continued presence of the dog would create an undue burden on its operations. There was also no evidence they engaged in a “reasonable accommodation analysis” or “fact sensitive examination” of Spence’s request for accommodation from the “no pets” policy as required under state law.